Patricia Franchini: "I don't know if I'm unhappy because I'm not free, or if I'm not free because I'm unhappy." 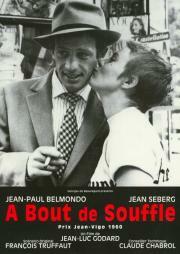 a bout de souffle was a revelation in its time, a direct usurpation of the old guard of the cinema. godard's free wheeling direction, its existential message was so novel that it became it's own thing, the nouvel vague. leaving the obvious aside, the film relies heavily on the charisma of the leads, particularly belmondo, who became a star with his role. in some ways, cinema did actually stay the same. Decent but not great. Tries way too hard to be cool. Seberg's accent when she speaks French is horribly grating. If it weren't for the beautiful cinematography there wouldn't be much here worth anything.